The rise of ostensibly healthy bowl-and-salad concepts in 2016 has the Chain Store Guide restaurant-and-foodservice team expecting more from this fast-casual vertical in the coming year. Here’s a look at a number of companies we expect to grow in 2017. Source: Chain Store Guide’s Restaurant Franchisee Premier Database. Sweetgreen: The founders packed up their bags in early 2016 and headed west out of Washington, DC. From its new headquarters in Culver City, CA, Sweetgreen will expand its California and West Coast presence, joining fellow Culver City-based Tender Greens (see below) and others – such as Mixt (9 locations) – in growing the market. Sweetgreen nearly doubled its store count by adding 28 locations in 2016, and its goal is to reach 100 units in 2017, so look for 40+ openings. Sweetgreen’s current footprint includes California, DC, Illinois, Maryland, Massachusetts, New York, Pennsylvania and Virginia. MAD Greens: Mad Greens put the Coors money to work this year by adding a dozen restaurants and expanding into Utah. (A Coors-family company and CEO Darden Coors purchased Mad Greens in 2013, though the original founders remain actively onboard.) Look for another 15-20 units in 2017 in Arizona, Texas and Utah with a few new stores for the company’s home state of Colorado. Grabbagreen: In business since 2013, 2017 should be the year that it all comes together for this Arizona-based concept. 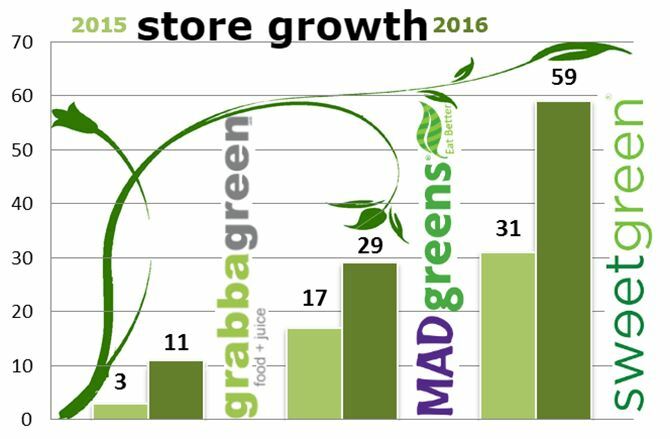 With a few company-owned locations at the beginning of 2016, Grabbagreen and its franchisees now have 11 locations in six states, with many of the new locations opening in the last quarter of the year. If the pace continues, CSG projects 20+ (predominantly franchised) store openings next year. Tender Greens: Expansion was on hold at Tender Greens in 2016 (and we, therefore didn’t stick them on the chart above), but all signs point to increased activity from this 23-unit chain in 2017. The company received a minority investment from Danny Myer and his Union Square Hospitality Group in 2015, and in May of this year it created and filled two new expansion-focused positions – VP of Operations and VP of Real Estate and Development. For further information about the companies featured in this report, including contact information, personnel data, and updated projections for store openings, check out our Restaurant Franchisee Premier database.